A first look at the components of the new Neptune Systems ATK. Morgan Hill, May 24, 2017 – Neptune Systems today launches the ATK – Automatic Top-off Kit, its first aquarium automation product that operates either standalone (without the need for an Apex System) or connected to any current Apex model. 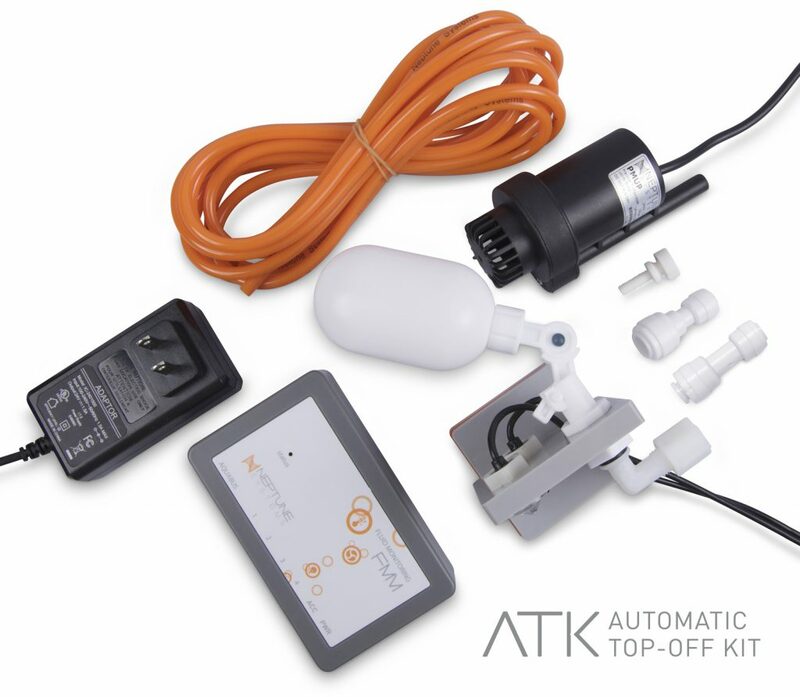 The ATK – Automatic Top-Off Kit is the solution to the dreaded (and often neglected) daily task of adding fresh water to an aquarium to make up for evaporation. The concept of an Automatic Top-off (ATO) itself is nothing new. However, the ATK brings safety and simplicity together with its plug-and-play installation combined with three levels of disaster prevention. “We’ve wanted to do an ATO for a long time. We were patient though and waited until all the stars aligned so we could bring to market a solution that not only had redundant safety features, but was also super-simple to install and operate”, said Terence Fugazzi, VP, Sales and Marketing for Neptune Systems. The magnetic-mount water level mechanism for the ATK is placed in the filtration area of the aquarium. When the water level drops below the lower sensor, the ATK turns on its included pump, and water is pumped from the fresh water reservoir to the aquarium until the optical sensor is covered. At that point the ATK turns off the pump. This will occur several times a day as necessary depending on the evaporation rate of the aquarium. The problem with many existing ATO solutions is that when something goes wrong, it often means an overflowing aquarium and a flooded house. The ATK though has three levels of protection against such a mishap. First, if the primary optical sensor should fail, there is a second optical sensor there as a backup. In the unlikely event that second sensor should also fail, the built-in algorithm called IQ-Fill will stop the water. If there still is a malfunction sending water to the aquarium, the physical float valve on the ATK will hold back the water, and prevent it from overflowing your aquarium. The business end of The ATK: two optical sensors plus a magnetically-mounted float switch for fail-safe redundancy. In addition to the backup optical sensor and mechanical float valve, there is a third safety feature of the ATK called IQ-Fill. IQ-Fill is an algorithm built into the ATK that records the recent run-time-lengths and then creates a maximum fill time value that adapts to your aquarium and environment. The ATK will never run longer than twice its average run-time. The ATK works with any Apex (Neptune Systems’ monitoring and control system) – even the Apex Jr. In an effort to make the installation of the ATK the simplest it could be for Apex owners, a new feature called Tasks was created in our Apex Fusion cloud service. Simply put, Tasks takes the user one step closer towards eliminating programming for the most common aquarium automation needs. For the ATK there is a Task guides customers step-by-step from start to finish of their ATK setup, without once having to look at any Apex programming. Additionally, there are Tasks for other common functions, and more will be added ongoing. 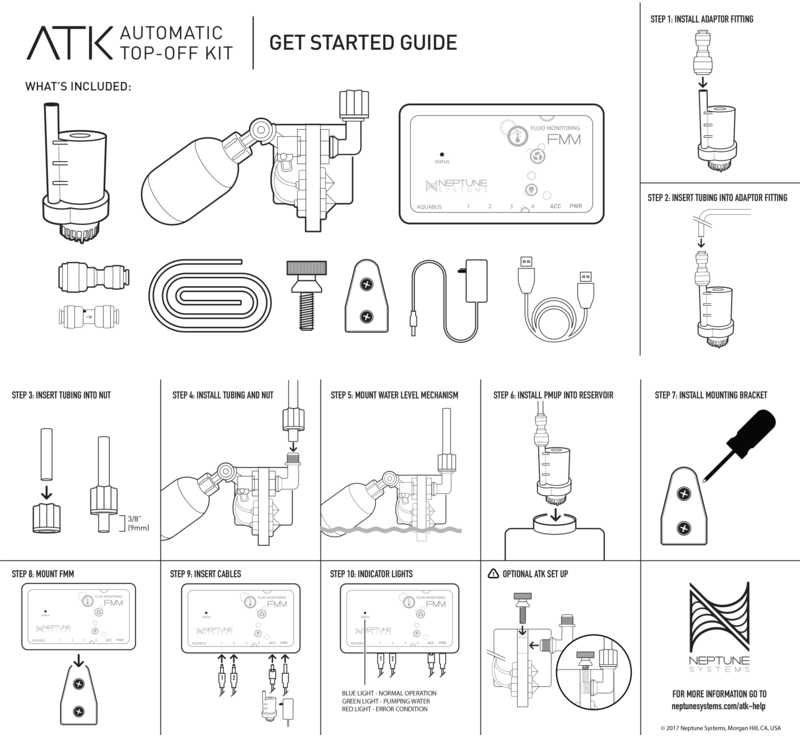 An extremely concise Get Started Card simplifies setup of the ATK. Included as part of the ATK is Neptune Systems’ PMUP. This powerful 24VDC utility pump is unlike any pump provided with exiting ATO packages. The PMUP is built to last and can push water vertically up to 14 feet. This means it can be used to pump RODI water up from a lower floor storage area or basement. The ATK has four digital I/O ports with only two of them being used for its included optical sensors. This leaves two ports open for use with optional sensors and accessories. 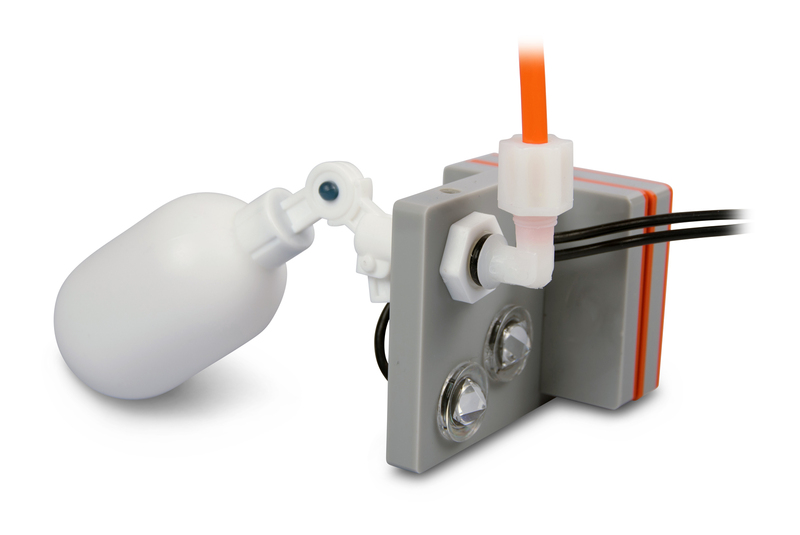 Available separately are magneticmount optical sensors and leak detection probes which can be used even when the ATK is not connected to an Apex. For instance, an optical sensor could be placed in the bottom of the water reservoir to prevent the PMUP from running dry. When the water level drops below that sensor, the alarm will sound and the ATK will cease operation. Price and Availability In the USA the ATK retails for $199.95 and is currently available at all major Neptune Systems dealers both online as well as local marine aquarium stores.